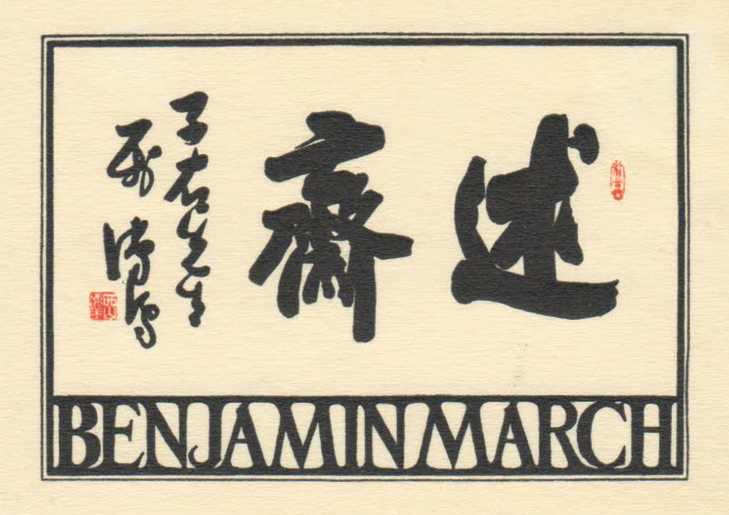 NOTE: Writer, curator, and professor Benjamin Franklin March Jr. (1899-1934) studied, lectured and wrote in the United States and in China. Through his works he became one of the foremost authorities on Chinese art during the 1920s and 1930s. In this essay he analyses the different functions of Western perspective (optical) and Chinese perspective (axonometric) and on what grounds they differ. It is one of the first attempts to understand Chinese pictoral space on a structural and a conceptual level and it became an important reference on Chinese space in Joseph Needham’s book Science and Civilisation in China Vol. 4 part 2 in 1965. This essay was first published in 1927 in The China Journal Vol. VII, No. 2, pp 69-72. The most general criticism aimed at Chinese paintings by Westerners seems to be concerned with the representation of distance, and very often takes the form: Chinese paintings have no perspective. This is, of course, not only untrue, but it is not what the critic meant to say. Perspective, after all, is nothing but a convention for representing distance, and though the term is sometimes limited to mean the type of projection generally used in the West, it properly includes any and all devices for representing three dimensions in two, for symbolizing three-dimensional space on a plane. In painting, the third dimension is usually in recession from the painter, and the plane, either physically or so far as the image is concerned, is perpendicular to the direction of recession. Obviously no perspective can be absolutely true, since two dimensions cannot be three, and the truth of the convention depends not so much upon science as upon custom. It is common, however, for foreigners to regard Western perspective as somehow truer than the Chinese perspective, and it may be worth while to examine the two from the standpoint of Western mathematics, to determine by Western standards whether or not the criticism is valid. The problem of representing three dimensions is most acute in the painting of landscapes (山水) and the painting of figures (人物), the first two of the traditional four classes of Chinese paintings. Petrucci and others have discussed landscape perspective, and this is the least difficult for foreigners to grow accustomed to and enjoy. The convention of representing buildings and furniture, on the other hand, often seems primitive and inaccurate even to stout protagonists of Chinese landscapes; so we shall limit our discussion for the present to a comparison of Western and Chinese methods of representing three-dimensional solids such as buildings and furniture. In the West, perspective is achieved by directing the lines of the drawing toward two hypothetical vanishing points, with the result that lines parallel or equidistant in nature are convergent on the picture plane. This type of projection depends upon the non-Euclidian definition of parallel lines as lines that meet at infinity. The projection of a point at infinity in a line is a finite point, so the meeting point of the parallel lines becomes projected as a finite point known as a vanishing point. The basis in experience for this definition, which is a compromise between two experiences, is easy to demonstrate, and the demonstration also explains why pictures drawn in accordance with this theory appear to conform to the true appearances of objects. If the eye of the observer be considered stationary, the field of vision embraces a segment of a circle somewhat less than a semicircle. If this field of vision be regarded as consisting of a number of arcs of different radii drawn with the eye as a centre, it will be seen that a house located on the arc of ten-rod radius occupies a larger proportion of its arc than the same house, at a distance of a hundred rods, occupies of its arc. The distant house, then, fills a smaller angle in the field of vision than the nearer house and by comparison seems smaller. That the appearance of distance is a matter of comparison becomes clear when one considers the difficulty of estimating distance across water or on a level plain. The same thing that is true of two houses will be true of the parallel lines of a railway track, or of a road, or of the walls of a room. They appear closer together at a distance because they occupy there a smaller fraction of the arc of that distance than they do in a nearer position of a nearer arc. Since the lines are continuous and the number of arcs and radii infinite, lines appear to converge evenly and steadily. The accompanying diagram (Fig. 1) will serve to illuminate the discussion. The Chinese, in common with the rest of mankind, have had the experience on which the non-Euclidian definition of parallel lines and the Western method of projection is based, and in their landscapes they represent distant things as smaller than near things. In their drawing of buildings and furniture, however, they make the lines that are parallel or equidistant in the object, parallel or equidistant in the drawing of the object. In a picture of the interior of a room, for instance, the walls are by measurement the same height throughout their length. The lines of tabletops are exactly parallel. But the definition of parallel which we must adopt here is that of Euclidian geometry ; that parallel lines are lines that never meet. This theory has its basis in experience no less than the other, for we all know that if the sides of the table on which we write, for instance, are exactly the same distance apart they will not meet, no matter how far they may be prolonged ; and we have learned to speak of them as parallel lines. From the standpoint of Western mathematics and geometrical definition we cannot say that either theory or method is more or less true to nature than the other. The question that naturally arises then is : which is the better? An answer to this question must frame another question: which has been most useful in helping the painter to solve the problem he set out to solve? There is not now sufficient evidence at hand to answer this question. The Chinese method has the limitation of being able to present only three of the six surfaces of a normal interior, whereas the Western method makes the projection of five surfaces possible. The diagram in which the same interior is drawn according to the same scale by the two different methods of perspective will illustrate this difference. (Fig. 2). If the Chinese ever systematically attacked the problem of representing five surfaces of an interior and were not successful in their solution of the problem, then we might call their perspective in this regard primitive and less satisfactory than the perspective of the West. If they never approached the problem it is hardly to their discredit that they did not solve it.